Two would-be class-action lawsuits in the Western District of Washington allege that insurers arbitrarily deflated the amount offered consumers for totaled cars using CCC software. Neither Olberg and Palao-Vargas v. Allstate nor Lundquist v. First National name CCC as a defendant, suing solely their titular insurers on behalf of individual plaintiffs — and, should the court agree to the class, thousands of other first-party claimants across Washington who received certain total loss offers “from the earliest allowable time to the present,” according to both cases. Both cases accuse their respective insurer of improper behavior related to settlement values based upon “comparable vehicles reduced by a ‘condition adjustment. '” Olberg v. Allstate also claims the carrier inappropriately treated at least one “gray-market vehicle” originally intended for Canada or other countries as comparable to a totaled American vehicle. “First National instructs CCC as to what specific data to include in the report as the basis for the valuation, including whether to include condition adjustments to comparable vehicles,” the lawsuit states. First National’s three comparable vehicles all had a $936 condition adjustment, a deflation the lawsuit claimed breached the contract and stiffed Lundquist out of $936 by not using the “actual cash value” of the trucks and by not itemizing or explaining the “condition adjustment.” The lawsuit also brings bad faith and deceptive trade pratices claims and seeks an injunction “permanently enjoining First National from basing its valuation and payment of the claim on values of comparable vehicles that have been artificially reduced by an arbitrary and unjustified ‘condition adjustment’ that is not itemized or explained. The Olberg case makes similar claims regarding Allstate’s totaling of the two plaintiffs’ cars. Cecilia Ann Palao-Vargas’ 2011 Hyundai Sonata was totaled over a 2015 crash with a payout of $15,034.93, minus deductible. Again, Allstate used a CCC valuation report with nine similar vehicles, this time with a $684 “uniform condition adjustment” applied to all nine without itemization. All three plaintiffs alleged their respective insurer “fudges the numbers to shortchange vulnerable consumers, who have often lost their primary car” and need fair value back from the carrier to buy a new vehicle. CCC declined to answer general product questions about CCC Market Valuation reports, including whether condition adjustments are calculated by CCC or customized to the insurer. 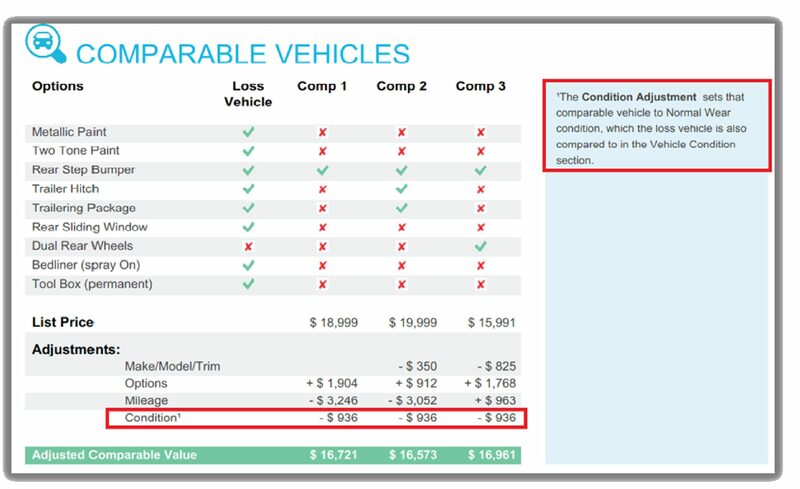 “When settling a total loss vehicle claim using methods in subsections (1) through (3) of this section, the insurer must … Base all offers on itemized and verifiable dollar amounts for vehicles that are currently available, or were available within ninety days of the date of loss, using appropriate deductions or additions for options, mileage or condition when determining comparability,” Washington law states. Part (5)(d) of the law does require explanation and itemization — but only for the claimaint’s vehicle, not the comparison ones, according to First National. “Insurers may adjust a total loss settlement through the following methods only … Any additions or deductions from the actual cash value must be explained to the claimant and must be itemized showing specific dollar amounts,” the law states. “Subsection (5)(d) does not apply to condition adjustments made to comparable vehicles,” the insurer wrote. 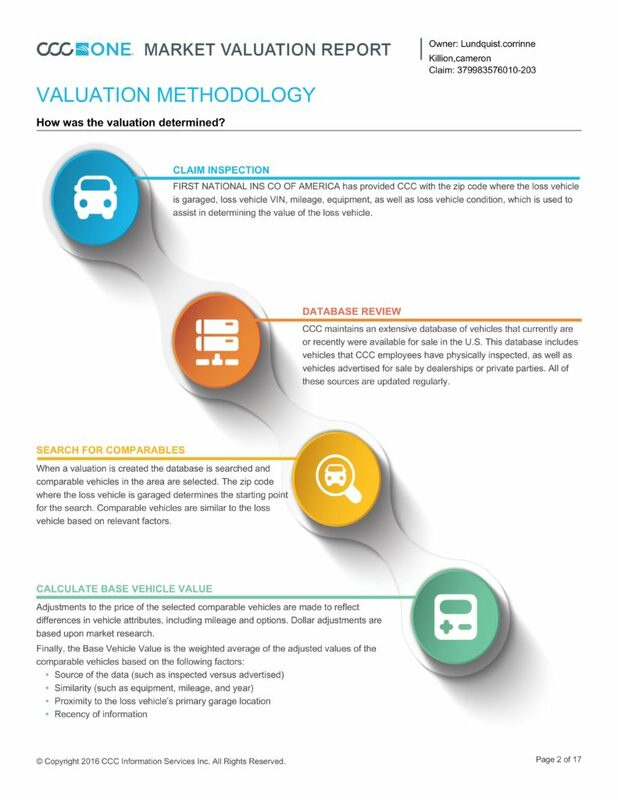 (f) The location or contact information for each comparable motor vehicle at the time of the valuation. (a) The source must provide a list of comparable motor vehicles used to determine the actual cash value. If more than thirty comparable motor vehicles are used, only thirty must be listed. (b) Any supplemental information must be clearly identified with a separate heading. In wonderful Bill Clinton “define is” factor, First National argues that “all” doesn’t really mean “all” the information it internally used to calculate the cash value, such as whatever deductions they made to the comparison vehicles. Notably, that regulation specifically requires disclosure of “[a]ll information collected during the initial inspection assessing the condition, equipment, and mileage of the loss vehicle,” but no such requirement exists with respect to the condition of the comparable vehicles. Similarly, when using a computerized source to determine actual cash value, the regulation requires that “[a]ny weighting of identified [comparable] vehicles to arrive at an average must be documented and explained,” but no other category of information must be explained. The express mention of one item (e.g., disclosure of “all” information relating to the condition of the loss vehicle or explanation of weighting of comparable vehicles) implies the exclusion of others (e.g., disclosure of detailed information relating to the condition of the comparable vehicle or explanation of condition adjustments to the comparable vehicle). (apply the canon of expressio unius est exclusio alterius to interpretation of regulations). However, we’d argue that all information the carrier used would indeed include its rationale for the particular numbers used. Regardless, the carrier said it did indeed itemize and explain its adjustments. 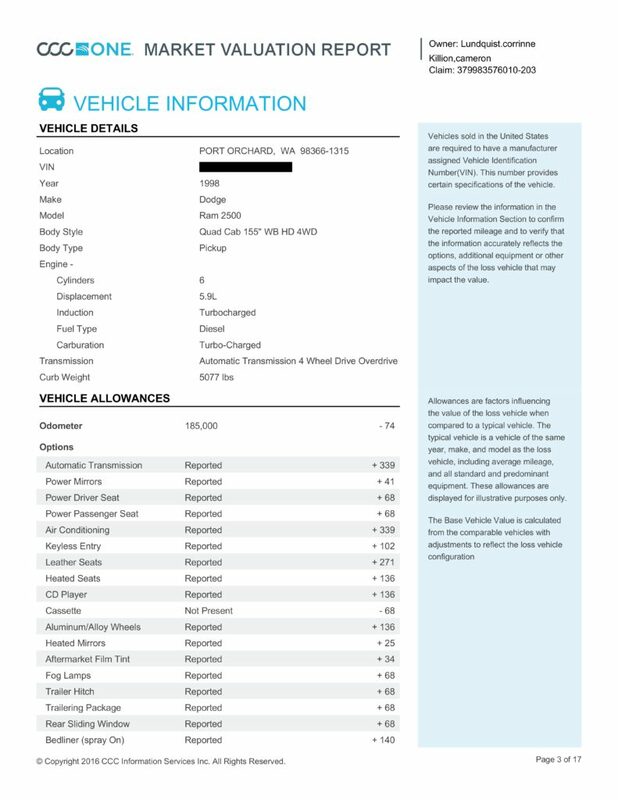 “As the note in the right-hand column of that same page explains: “’The Condition Adjustment sets that comparable vehicle to Normal Wear condition, which the loss vehicle is also compared to in the Vehicle Condition section’ In other words, the condition adjustment to comparable vehicles was made in order to perform an apples-to-apples comparison between the loss vehicle, which is most commonly in Normal Wear, and the comparable vehicles, which are most commonly in Dealer Ready condition,” First National wrote. The carrier even credited Lundquist for having a dealer-ready dash and engine, kicking $102 back in his favor. Just because Lundquist called the $936 reduction “arbitrary and unjustified” didn’t make it so, certainly not enough to let the litigation stand, First National said. It’ll be interesting to see if the court agrees that assuming comparison vehicles are in better shape than a customer’s car is a fair assumption or sees First National as making too much of a leap. Olberg and Palao-Vargas are pursuing the same claims and injunction as Lundquist against Allstate. But they also seek a permanent injunction against Allstate from using “gray-market vehicles” to calculate how much to pay a total loss policyholder, as the carrier was accused of doing for Palao-Vargas. “Allstate instructs CCC as to what specific data to include in the report as the basis for the valuation, including whether to include condition adjustments to comparable vehicles and whether to base the valuation on gray-market vehicles that are not comparable to the insured vehicle,” their lawsuit states. a. For a given year, make, and model, vehicles made for non-U.S. markets such as Canada have different safety and environmental specifications from vehicles made for the U.S. market and require modifications to comply with U.S. law. b. Gray-market vehicles frequently lack a clear chain of title, increasing the risk that the vehicle has been stolen. c. Gray-market vehicles are manufactured with an instrument panel and odometer that uses kilometers instead of miles, and the conversion from kilometers to miles creates a risk that the odometer has been manipulated. d. The prices of gray-market vehicles are depressed by arbitrage. Because vehicle supply and demand varies from one country to the next, the cost of a gray-market vehicle is often lower than a vehicle of the same year, make, and model made for and sold in the United States. A gray-market car isn’t the “comparable motor vehicle” required under Washington law, the lawsuit states. “The use of gray-market vehicles to calculate the value of the loss vehicle artificially reduces the valuation of the loss vehicle to benefit the insurer at the expense of the insured,” the lawsuit states. Allstate’s spokesmen don’t comment on pending litigation, and none of its counsel responded to an email request for comment Friday afternoon. CCC also declined to answer general questions on whether the carrier or CCC makes the decision to include “gray-market” vehicles in a valuation result and why the IP would bother researching and providing such controversial data in the first place given the amount of truly U.S. vehicles for sale. For example, in Palao-Vargas’ case, would it really have been that hard for Allstate to find nine U.S. 2011 Hyundai Sonatas within 150 miles from her house (the generally maximum distance acceptable under Washington law)? As of Friday, there’s a couple dozen of them for sale within a mere 100 miles of the district court’s ZIP Code, according to Autotrader.